Tommy Bahama is not on my list of go to places for clothing or anything at all. 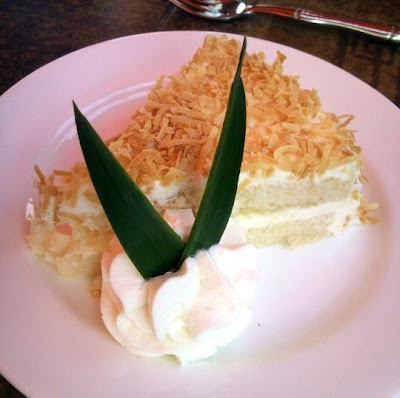 When a gal pal recommended Tommy Bahama Restaurant at Newport Beach for our luncheon during Orange County Restaurant Week, I was somewhat skeptical. But, as she is a foodie, I figure what not. Let me just say I was really impressed with the atmosphere, service and food. I would go back and bring all my friends. Our server was super attentive; he anticipated our needs. We really pigged out that day, but I was a happy pig! 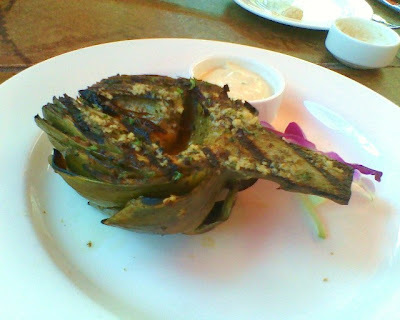 Marinated & Roasted Artichoke with lemon butter --- I usually won't order artichoke but this is really good. I want to try this again so I can try it at home. 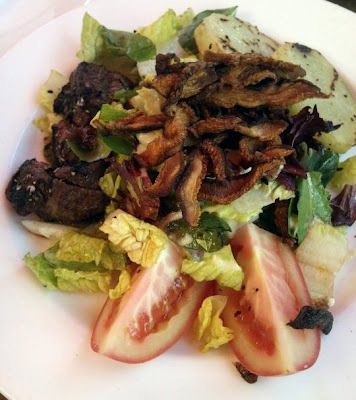 Grilled Beef Salad with Fried Shitake Mushroom --- I never tried Shitake fried before but it was unique and quite good. Chocolate Fudge Cake --- Death by chocolate in my humble opinion. All in all, I loved all the appetizers and main dishes, but I was not too crazy about any of the 3 desserts because they were really sweet. Perhaps I just didn't have room for dessert anymore. I will be willing to give dessert section a try another day. 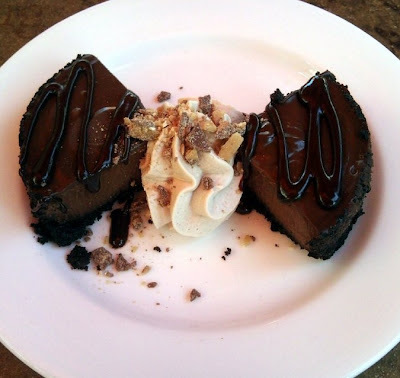 Usually I will refrain from ordering dessert dining out or I will share with my friends. So do you order dessert when you dine out? For those living in So Cal, can you recommend places for me to try? I love new restaurants. LOL, I worked in a Tommy Bahama boutique when I spent a summer in Florida several years ago. There wasn't a restaurent, though. That food looks YUM! Those foods look so delicious! YUMMY! Make me hungry girl! Did you see the 99 things to eat in LA before you die list? Honey my Heart and Femme Rationale listed it. I'm totally eating at those places when I visit! Those all look really good! 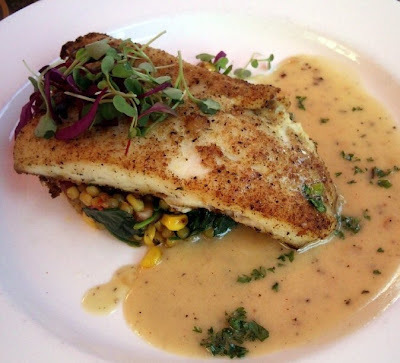 That grilled halibut looks heavenly! yum! My , my , this is night and I see this ! Great , I'm now hungry ! Haha . Seems so yummy ! I rarely order dessert dining out, and I rarely dine out on top of that. All the coconut sounds soooo good though. Wow, they all look so nice and well presented - I'm hungry now! Man, that food looks AMAZING!! Wow, yum, great photos too, if I may say! 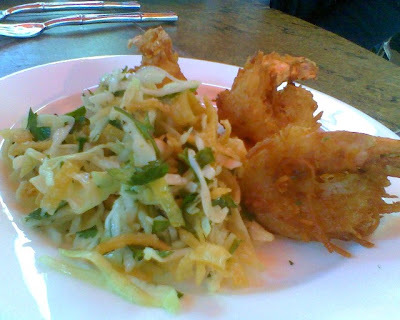 That coleslaw, to balance the fried shrimp, looks like a great pairing. Mangoes and chicken were made for each other, too! I usually like savory and salty foods more than sweets. Sometimes I'm tempted by the look or sound of dessert into ordering one, but I usually regret it because I'll find it too sweet. I knew someone who worked at Tommy Bahama...that's the entirety of my Tommy Bahama experience. Well, I think I once bought a shirt for MrB. Oh I've been there! It's really good!! I'll have to check it out the next time I'm out that way! thx for the suggestion! 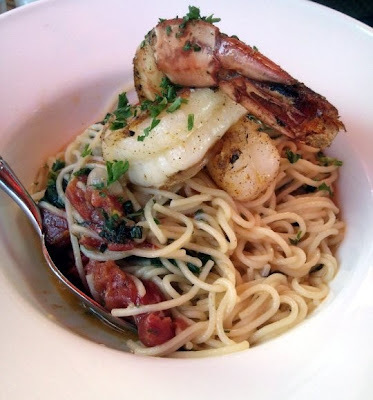 Have you ever been to Bossa Nova? It's yummy Brazilian food, not fancy but really good. Oh my goodness, you have me craving all this yummy food. I want it all so much! Delicious! Hi there! You might want to check out my blog! Wow...what incredible choices. I was salivating over the picture of the chocolate cake. Death by chocolate would be a sweet way to go, pun intended! Looks delicious! 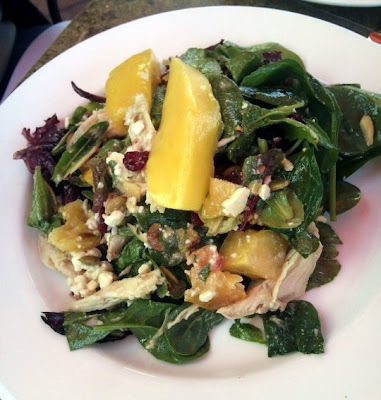 The marinated artichoke and mango chicken salad - yumo!!! Thanks for sharing. I just had dinner, but I think I just got my appetite back. I had no idea there was a restaurant!! I always just assumed it was a clothing store only. So strange. The food looks delicious!! Now I am curious to go and try it out. But I doubt there is one anywhere near Missouri. Hahaha! 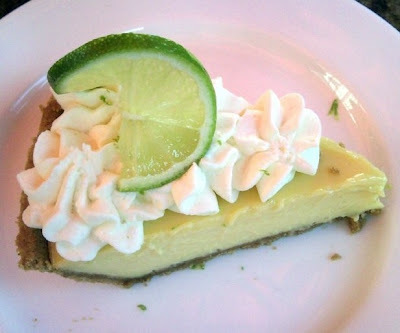 oh my...Key Lime Pie is my favorite, favorite in all the world!